Known in the 1930s and 1940s for his paintings and etchings of war industry workers, inner-city street scenes, and urban architecture, Frederick B. Taylor, the younger brother of millionaire, E.P. Taylor, was born in Ottawa. From 1916-18, his father’s employment with the Canadian army took the family to London, England, where Taylor attended secondary school. Returning to Ottawa in 1918, Taylor completed high school at Lisgar Collegiate. According to art historian Barry Lord, his parents disapproved of his artistic ambitions and insisted that he obtain a degree before he beginning art studies in earnest. In 1925, he enrolled at McGill University, Montreal, to study architecture, and at the same time maintained a high level of sporting activity, excelling both in skiing and boxing. In 1927, he received the Anglin Norcross Historical Drawing Prize in Architecture and the heavyweight boxing championship for McGill. In 1929, before completing his studies, he oversaw the construction of the Willingdon School at Notre-Dame-de-Grace for the Protestant School Board of Montreal, and in the same year, began drawing classes with Edmond Dyonnet. Following graduation from McGill in 1930, he was hired to oversee architectural projects for the Bank of Montreal and received the Governor General’s medal for Professional Practice and Building Law, as well as a grant to further his art studies in Europe. In 1931, he trained briefly with LeCorbusier, and also took a course in art history at the Sorbonne. Returning to Canada he moved to Ottawa where he studied drawing with Ernest Fosbery, and in early 1932, made his first forays into etching and engraving. Deciding at this time to abandon architecture, he established a printmaking studio and produced images of scenes of Europe, skiing, and views of the Parliament Buildings. Returning to London in January 1934, he studied drawing, etching and lithography at the London Central School of Arts and Crafts with Bernard Meninsky and W.P. Robins, and drawing and etching at the Goldsmith College of Art with J. Baleman and Stanley Anderson. Later that year, he returned to Ottawa and secured a commission to etch portraits of Canada’s prime ministers. From September to December 1935, he was back in England studying again with Stanley Anderson, and painting and drawing with F. Ernest Jackson at the Byam-Shaw School of Painting, Drawing and Design. In 1936, he traveled to Scotland and Scandinavia, and exhibited an oil painting at the Royal Institute of Oil Painters, London. In 1937, Taylor settled in Montreal with his wife, Hilary Miriam Magee, and established himself as a portrait painter. He was also politically active, and along with other Montreal artists, became involved with the Committee to Aid Spanish Democracy. At this time he also produced etchings of the Montreal harbour, prominent city architecture such as Church of Mary Queen of the World, and the Sun Life Building, as well as picturesque street scenes. With the outbreak of war in 1939, Taylor began a campaign to persuade the Government to support a war art project that would document the war industry workers at home. This, he argued, would increase patriotism amongst the workers and promote loyalty to the cause. In the same year, he approached writer Stephen Leacock and asked if he would sit for a portrait – the writer acquiesced and the portrait was later acquired by McGill University where Leacock had once lectured. Although his own art was his primary focus, from 1940-43, Taylor taught drawing and sculpture at the School of Architecture at McGill. In 1941, he attended the Kingston Conference where over 150 Canadian artists discussed the role of the artist in society and called for a war art program and Government commissions. Following the conference, Taylor became a Charter Member of the Federation of Canadian Artists (FCA). In 1943, he became the FCA Chairman of the Quebec Region, and from 1944 to 1945, the National Vice-President. Intent on recording the war industries, and aided by family connections, Taylor finally gained access in 1942, to the Canadian Pacific Railway’s Angus Shops in Montreal where the Valentine tanks were produced. Paintings such as Applying the Tracks, 1942, shows a small team of men united in their heroic efforts to pull the tank forward and force the track into its cogs, and is typical of his desire to portray the cooperative spirit of factory work. Taylor was not satisfied with merely producing paintings that depicted the war effort on the home front; he also felt strongly that they should be exhibited in places where workers could see them. Subsequently he arranged for their display in factory lunchrooms, union halls, and in 1944, in the meeting rooms of Lodge 712 of the International Association of Machinists, Montreal. “My experience in painting war industry”, he wrote, “completely explodes the widely held idea that art only concerns the privileged and the initiated. This idea, or myth, is that art is not for the people. It is false. Workers are quick…to recognize that art and life are one.” In addition to the factory paintings, Taylor also did portraits of workers, lettering them with patriotic slogans such as “Serving on the Industrial Front”, in hope that the Government would reproduce them as posters. The Government refused, so Taylor sent them back to the unions and companies concerned. After the war, Taylor continued to execute paintings and prints of social realist subjects as well images of Montreal street life, back alleys, old neighbourhoods, and scenes of children playing. 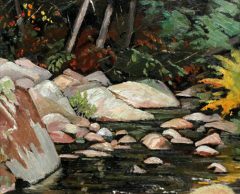 He also traveled around the province of Quebec to Quebec City and the Charlevoix region, executing city and countryscapes. In 1951, Taylor made his last etching, Joe Cadloff, and in February, he had a solo exhibition at the Dominion Gallery, Montreal, where he exhibited 80 paintings depicting views of Montreal, Quebec, and Nova Scotia. In May, he spent three weeks in the USSR as a member of the Canadian-Soviet Friendship organization. From 1950 to 1953, he painted a series of paintings focusing on workers such as fishers and loggers. Between 1954 and 1959, Taylor began a series of long sojourns to Mexico with his second wife, the painter Nova Hecht, and by 1960, settled permanently in San Miguel de Allende. Afflicted with arthritis, he began to explore silkscreen printing. In 1963, after traveling in Europe for a few months, Taylor had a solo exhibition of his paintings at The Artlenders gallery in Montreal where he showed Mexican street scenes, markets, and portraits. He also began to sculpt in bronze and stone at this time. Between 1963 and 1973, he had regular exhibitions in Montreal and Toronto, at the Dominion Gallery, Jeanne Newman (formerly The Artlenders), and Walter Klinkhoff Gallery, among others. In 1971, he donated 75 etchings to the Montreal Museum of Fine Arts. Throughout his long career, Taylor exhibited widely in Canada, the United States, England and Mexico, and between 1932 and 1963, his work was the subject of 14 solo exhibitions. Taylor died by his own hand in San Miguel de Allende in 1987, leaving his third wife, Fen Taylor.